The problem I have with Ivanovs is that his music just isn't that individual. It's as if he was trying too hard to find his musical style when the reality was he had nothing musically interesting to say. A Rimsky-Korsakov, Prokofiev, Shostakovich, Stravinsky, Scriabin, or even a Myaskovsky he is not. Just saw this post of yours, John. I enjoy all of Ivanovs' compositions I've heard so far, but one work of his I would encourage you to revisit is his Symphony no. 20 (if you own the Naxos CD which contains it). It's a haunting, dramatic work that would appeal to you more than the more late-romantic earlier works, I would think. Ivanovs just isn't memorable enough for me, Kyle. Nothing sticks out in my mind as being worth listening to again IMHO. I also don't really hear an individual compositional voice either. thank you for mentioning the Art Music Forum... I just posted a ton of Estonian Music there also... its on mediafire for downloading.... enjoy !! I remember asking the late Francis Wilson of the lamented Olympia label why he didn't issue any Ivanovs to which he replied that he didn't find it memorable enough. However, I am with Kyle on this one and think that symphonies 2,3,4,11 and 20 are fine scores. I'm very keen on Ivanovs and last year, when I listened to ll the symphonies one after the other I wrote down some notes. If there are any mistakes here, please let me know. You'll see I like different symphonies to other contributors here. 1 One longish movement, quite lush and lyrical but with backbone, beginning with lyrical passages and ending in dance measures. 2 Three slow movements, beautiful, but not much go. 3 Moving away from earlier style to middle style, more forceful, four-movement (with scherzo 3rd), remarkably limpid slow movement. 4 His longest symphony, the Atlantis Symphony. First movement (‘Wrath of the God – Legend’), begins angrily and then carries on with a portrait of Atlantis at the height of its arrogance and power; long slow movement with women’s voices (Nereids) shows Poseidon’s underwater realm; scherzo (‘Sacred Temple’) is a depiction of a gathering storm on a mountain, with a quiet interlude; Finale continues with this stormy music to the catastrophe that overwhelms Atlantis, ending with a return to Poseidon’s underwater music (minus the voices). 5 Longish, end of war, stressful type symphony with mixed moods of fear and triumph. 6 ‘Latgale Symphony’, folkloric, relaxed, longish. 8 Brilliant, fast, dramatic, use of harp as flowing and twirling instrument; limpid, flowing slow movement with faster passages, finale with brass chorale. 9 Harsher in mood (like 5), dramatic; plangent slow movement with slow lyric coda; exciting finale also with slow coda. 10 Brusque and forceful throughout. 11 Even more savage than 10; slow movement second, funereal but with instrumental solos; violent scherzo; finale slower and more consolatory with slower and quieter coda. 12 A symphonia brevis, two outer movements vigorous and short, short intense slow movement second, intermezzo style third movement (longest in work) with muted close. 13 A three movement symphony with prologue, epilogue and interludes of spoken commentary (Paean to Lenin). Music intense with three medium fastish movements. 14 Symphony for strings, three movements slow-fast-slow, intense. 15 Back to a long vigorous first movement and savage scherzo second pattern. However style less declamatory, more motivic, more reflective passages. Slow movement odd, grotesque fragments and figurations build to a genuinely impressive climax. Finale not too long, vigorous, but with reflective passages, ends quietly. 16 Slow introduction to first movement, first movement faster section as in previous symphonies but more relaxed with lyrical and reflective episodes; short vigorous scherzo; serious slow movement; noble finale. 17 As 16 but first movement has more slower and reflective passages as does the scherzo; the slow movement is warm and sensitive, the finale is tumultuous and magnificent, ending quietly. 19 As 17 and 18 but even broader, magnificent long slow movement, finale attains Brucknerian breadth but ends quietly. 20 First movement as 17-19, ending quietly with soft bells. Shorter slow movement second, but still very solemn. Retrospective minuet third (sounding like Respighi). Fourth movement with an air of retrospective on early symphonies, but modulates towards the style of the end of the first movement (bells reappear). 21 Three movement work completed by Karlsons. First movement vigorous and clear, second a grave slow movement with alternating slower/faster sections, final a set of variations? Including a waltz! Ends defiantly. [Revised version of completion differs in finale, ending quietly]. Should have added that 2,3,5,8,12 and 20 are available on Marco Polo/Naxos, the remainder (and other versions of some of those) can be downloaded from the Art Music forum (old Melodya recordings and/or Latvian Radio broadcasts). Not sure which featured on the old Campion label. Thanks for the synopsis of the symphonies. Music for the film 'Late Frost in Spring' with Symphony No 8 and Lacplesis Symphonic Poem. Possibly my favourite disc in their series. The film music is charming and memorable. Symphony No 1, Latgalian Landscape and Symphony No 2. I think that the Violin Concerto is on a CD of 'Baltic Violin Concertos'. I regret that Symphony 11 was never issued commercially on CD. besides the Piano Trio, what else is there? I can't find any other listing besides what's in the Grove. Good 3rd-tier composer. Very interesting to have a Latvian serious composer that is substantial, if not groundbreaking. How nice to have your imprimatur in this regard, - and a relief you didn't drop him to level 4 (or even "bad" 3rd-tier). I rate Ivanovs highly and find many of his works thought-provoking and moving. Especially symphonies 8 and 20 (coupled together on a Naxos), 11, and 2-4. Yes, - at his best Ivanovs was a very fine composer. Those Symphonies which speak most strongly to me are Nos.4, 6-8, 11, 14-16, & 20. Nothing "3rd tier" about them. I'm with you in that they are good, and he incorporated Latvian folk melodies into the music, which is also good. This is how musicologists rate things. He's no doubt very famous in Latvia, but he didn't grab the world-tree and shake it, and a great majority of classical music enthusiasts won't even know who he is. Whether good or bad fortune, that's just life. Jut listening to the seventh symphony atm. That ominous theme in the slow movement... What work by Sibelius does it allude to? (Possibly unconsciously). 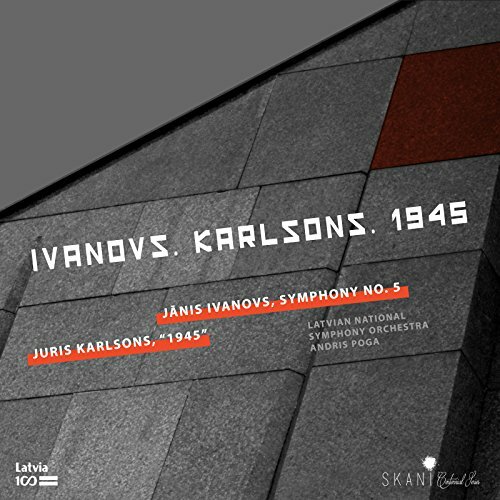 There is a new recording of Ivanovs Symphony No. 5 that I think is very fine. I like it better than the previous versions. Great news. Nevertheless, this label and others concerned should record the symphonies that are not on CD (e.g. 6, 7, 9, 11, etc. ) Fortunately, there are recordings of the complete symphonies, though some of them leave much to be desired in terms of audio quality. Have ordered this one. Great to see a new Ivanovs CD but I'd have preferred to see the excellent Symphony 11 issued on CD for the first time.